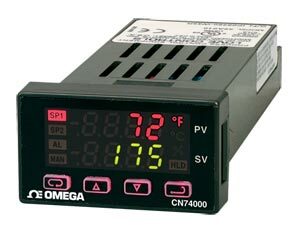 The CN74000 Series controllers set a new standard in 1/32 DIN power, flexibility, and value. Despite their small size, these controllers are loaded with features, including multiple universal inputs, fuzzy logic, autotune, auto/manual capability, and 16-segment ramp and soak with adjustable time base. RS485 serial communication is optional. Note: All thermocouple and RTD inputs can be set for 0.1° display. If temperature goes above 999.9° or less than -199.9° the display will return to whole degree resolution. * Process Input Types: The 0 to 20 mAdc, 4 to 20 mAdc, 0 to 10 Vdc, and 2 to 10 Vdc, inputs are fully scalable from a minimum of 100 counts span placed anywhere within the within the range of -1999 to 9999. Decimal point position is adjustable from the zero place (9999), tenths (999.9), hundredths (99.99), or thousandths (9.999).